Are you a lone wolf or do you believe there are still capable people around you? Starting a survival group makes sense in today’s political situation and social climate. You could make it on your own, but survival is much easier within a group of people. Here is what you can do to for your own survival group and make it work. As preppers, we must understand that we are not special and we cannot do everything to keep things in order. Is just not possible and you can’t be a hunter and a medic at the same time. There are tasks which require the help of your fellow neighbors and projects are done much faster when you have the numbers. Not to mention that surviving alone is not ideal and it takes a toll on your mindset over time. We are social creatures, and we evolved by sticking together and helping each other. Seeking out like-minded people should be the first step in establishing a survival group. The number of preppers is increasing year after year, and we are no longer being seen as the “odd” members of society. While certain TV shows are twisting the reality of prepping, the increasing natural disaster in the U.S. made people realize that preparing for an emergency is just, and should be common sense. Before you ask what others can do for the survival group, you should ask yourself what you can do for it. You should become a valuable member and show others what you can bring to the table. Maybe you are trained in self-defense, maybe you have medical training, or maybe you are bushcraft master. All your skills should be brought forward, and you should never sell yourself short. It may look like you’re showing off at first, but it’s not a popularity contest. You should also consider your psychical condition. Some people can spend a lot of times outside, exploring the great outdoors, while others require medication to get through the day. Even if some members have certain limitations, that doesn’t mean they are less worthy to be part of your survival group. Be honest with yourself and don’t assume you can do more than you are capable. The point here is to become an efficient member of the survival group and be fair to others while acknowledging your own limitations. When people think about forming a survival group, they start with close friends and neighbors. Before you reach out to them, you should look closer to home. Your family is your immediate survival group, and you need to take them into account. Your kids and elderly parents have capabilities that can be put to good use. They can offer assistance with your prepping plans, and they can learn or teach you skills which you lack. When the group evolves, each individual’s qualities should be assessed, and roles need to be assigned accordingly. An elderly person may not be able to do more than cook or see after the kids, but it still makes a huge difference. Seek others in your proximity to expand the group. The group could be a few houses around your block or even a subdivision of a suburban neighborhood. Keep everything inside your survival group since once it is formed, it will not be open to outsiders. An effective survival group is an organized one. You can’t have order without an overall leader with a second in command. Most survival groups will choose people with clear leadership ability, perhaps military or law enforcement. However, the other roles in the group can be filled by anyone. Even more, they should teach their job to others so that the group can still function in case some member is lost. You should identify all the skillsets available in your survival group since not everything you may need is in your geographical area. Chances are you may need to extend your area of action, in case your team needs a profession that is hard to find. You may need a doctor, a mechanic or a farmer/gardener and there’s no guarantee you will find one in your neighborhood. In an efficient group, you will find people who can do more than one job. The more skills you have in the group, the better. There’s no point to having a good array of skills if you don’t practice and evolve them. Plan a weekend outing with your survival group and test their skills. A camping trip or gathering at someone’s house outside of town is an ideal scenario. You can even do it in your neighborhood and gather at a member’s house. Turn off the utilities and see how everyone is coping with privation. You can even establish a perimeter around the house and post guard during the gathering. It will help you practice your skills in a less stressful environment before the brown stuff hits the fan. Since you cannot predict the future and precisely establish how long a disruption may last, the goal will be to plan up to one year’s duration. 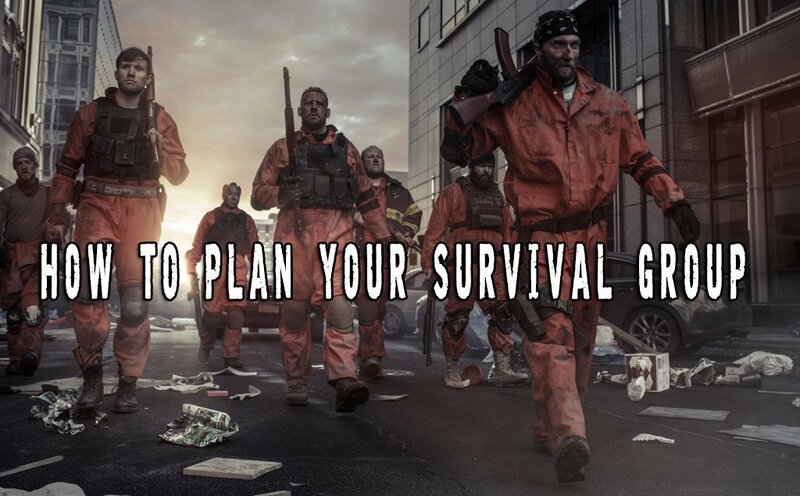 Your survival group will need all the basics to survive during that time. Water, food, clothing, tools, medicine, communication gear, weapons, and ammunition are all a must for each member of the group. You can help each other by sharing tips and information about your prepping plans. If there’s an ammo sale or if a nearby farm has a surplus of produce, you could save money, and everyone from your survival group will be prepared. The good thing about having access to a variety of resources is that you can trade for the things you need or those you want. Bartering inside your group is much safer than having to deal with outsiders. A smart prepper will always accumulate extra supplies for use in barter. Depending on how the survival group is formed, and the skillset it has, you may need to establish a bug-in territory. This may be your own house or a city block, whatever works and can be protected without putting everyone in danger. You also need to plan a bug-out scenario, since you may be forced to relocate to a place in the country if a natural disaster destroys your neighborhood. This will require transportation vehicles for both people and resources and a well-established transportation plan. Not everyone from the group will agree to leave everything behind when the time comes. If you establish a bug-in location, you should patrol the area around your territory. You will need to maintain awareness of local activities and keep everyone informed in case something happens. Depending on your region, you can either display a weapon openly or keep a low profile. Once it hits the fan, everyone approaching your territory must be stopped before entering your perimeter. All the talking and interrogation should be done outside that perimeter. They may be scouting the location, or they may carry infectious diseases. You also need to keep an open mind since some of the people approaching you may just need to barter, or they seek aid. You need to establish a protocol on how to handle outsiders and stick to it. They should acquire basic proficiency with firearms, and they should have their resources organized. Training together will help everyone from your group since you learn much faster by doing rather than reading or talking about it. If the order is given to evacuate, you can’t waste time because some members can’t find their bug out bags or they misplaced certain resources. Your escape and evasion load should always be ready, and everyone should follow an established bug out timeline. Ideally, everyone should have similar items in their bags so that each group member can go to any pack for support in an emergency. This is especially useful when it comes to firearms and ammunition since you can’t share ammo which is useless for your caliber. Organization and fluidity are the main characteristics of an efficient survival group. You can’t use an electric vehicle as a common resource if you don’t have a method of charging it. You shouldn’t pack food that needs cooking if your bug out plan doesn’t include a resting or camping spot. These are all things that can be discussed and members need to communicate to identify flaws which can jeopardize the integrity of your survival group. There’s no shame in asking for advice and people should trust each other. As I said before, immediate survival groups are forming inside families, and it seems this trend is growing. People are starting to show interest more and more to prepping and they are discussing with their neighbors about how to prepare better. I believe this year is a wake-up call for many out there and we can no longer ignore the natural disasters happening in our backyard. Forming a survival group will help you survive and learn how to prepare for a short or long-term disaster.